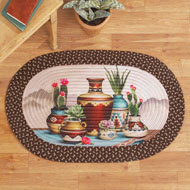 Kitchen Rugs, Accent Rugs, Runners & Mats | Collections Etc. 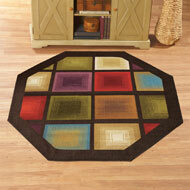 While some may consider kitchen rugs and mats a basic necessity, we here at Collections Etc. think of them as a source of happiness. They offer your feet and legs relief by providing a layer of protection from the cold, hard floor. They give your pets a cozy place to sit for their treats. And they definitely can help an entire room feel just a little more complete, especially with the charming choices you’ll find at Collections Etc. Add a light and airy feel with our kitchen accent rugs featuring floral and garden-inspired themes. Here you’ll be bringing a burst of the great outdoors into your home with details like birds, butterflies and stunning flowers. We love pets as much as our customers, which is why we also keep a steady supply of animal-themed rugs in stock. Cats and dogs make up some of our most popular choices, and people also go wild for our accent rugs and mats featuring roosters and cows. Kitchen rugs and mats with eye-catching designs feature things like wine bottles, coffee mugs, inspirational sayings and striking designs. Stripes, patchwork, border accents and traditional braided patterns are just some of the designs you may regularly find in our wide selection. Don’t forget the holiday accents, either. 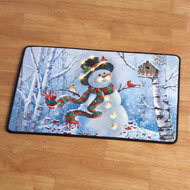 These affordable rugs come with holiday designs you and your family can enjoy year after year. Our collections are constantly changing, which means you can swap out your kitchen floor coverings as frequently as you wish. You’ll also find a variety of shapes and sizes, from standard accent rugs and floor mats to runners, corner rugs and even kitchen rug and mat sets. Some feature a pair of matching rugs, while others come complete with matching kitchen curtains.